Ok, here is something entertaining (And enlightening and educational at the same time) for an early Friday evening before we all get to start enjoying our weekends. But before I go into that let me share with you something else that I have been exposed to in the last couple of days that would make you think quite a bit. Remember the last blog post I put together over here on proving the business value of Twitter not long ago? Well, want to have something much more relevant and convincing with regards to how Twitter is shifting the conversations from the consumer market into the business world? Then go no further than to the fantastic blog post that Sam Lawrence, Chief Marketing Office at Jive Software and someone I first met through Twitter, although I have been reading his blog for a little while already, put together under the title "Twitter: A two-way social computer?". Sam put together one very thought-provoking blog entry that tries to explore further the aspects of the blurred, and thinner than ever, line between Web 2.0 and Enterprise 2.0 and how it is starting to tear down traditional concepts like the firewall, and behind the doors collaboration and knowledge sharing, with applications like Twitter. I shared my two cents of the conversation in there, but I strongly encourage you to have a look into the extended commentary, because a whole bunch of people coming from all sorts of backgrounds and areas of expertise, have been sharing some really insightful thoughts that will make you think for a few days. At least, it had that impact with me when I first went through them. So go and have a look and when you are done come back for that something entertaining I am about to share now and which has caught my attention over the last few hours. It all starts with Sam Lawrence, once again, who just created a blog post titled "Make Your Own Blog and Tweet Clouds", like this entry, and in it he shares a couple of very helpful tips for those folks out there interested around the subject of tag clouds and more in particular from social software tools people may use themselves. "You can either simply type the URL of any website in or upload a file and it will create a cloud for you. 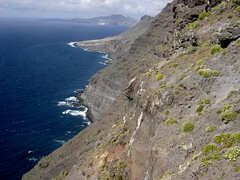 I tried it on a number of site and while it did create a nice looking cloud, obviously the entire site isn’t crawled. The clouds I looked at were clearly limited to the one URL I pointed to." And then he provided a screen shot of the one from his blog. Then the other helpful resource he talked about is one that I have been meaning to try for quite some time now and which time and time again it kept failing for me. Till today. So it seems to be a bit unstable. 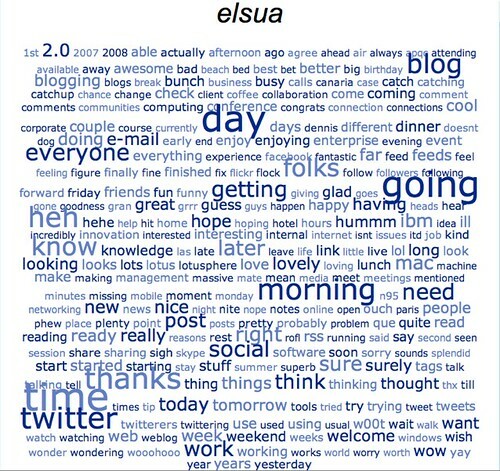 I am talking about TweetClouds, "which pulls the text from your Twitter archives and creates a cloud for you". And, of course, he shared details on what his tag cloud was for Twitter. Very interesting stuff to dive into, indeed. I bet the results would be just as surprising for those folks out there who may want to give it a try? 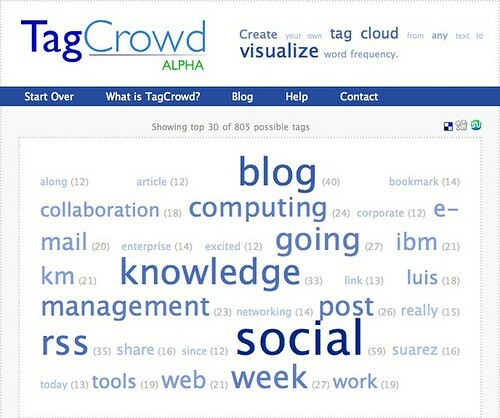 Fancy going ahead and start your weekend sharing what your tag clouds would be like? I bet you will find in there a surprise or two!